We believe this may be a promotional video for the new Myth Busters series. Its not the first time the crew from Myth Busters have used Bigfoot for their marketing campaigns. BFRO Describes the commercial below. There were television commercials running, in heavy rotation, on Discovery Channel Networks (Discovery Channel, Animal Planet, Science Channel, Travel Channel, etc.) 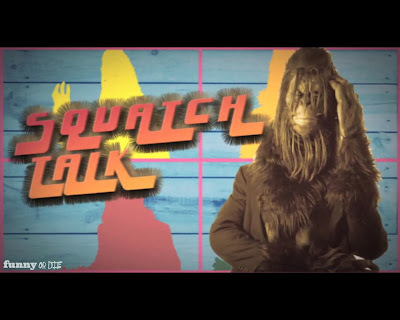 which show an actor in a bigfoot costume. "Bigfoot" has a French-Canadian accent. The costumed actor bemoans the looming threat posed by the MythBusters. The inference is that "Bigfoot" will be "busted" by the MythBusters ... so "Bigfoot" has a lot to worry about. BFRO continued to report on the possible reason for the commercial wwas due to a 2005 email campaign. The email campaign urged the MythBusters to bust the myth that the legend had been debunked. They did not urge the MythBusters to bust the legend. The producers allegedly responded and made it clear they weren't going to do anything on the subject, because there was no practical way to approach it. The many emails may have demonstrated to the MythBuster producers that IF there was an episode wherein the MythBusters busted the "myth" of "Bigfoot", lots of people would tune in. So it now appears that even though the MythBusters are not going to look into the subject at all, they still want the ratings boost they would receive if they were going to look into it. Which is just fine by us. We think, If the Myth Busters did entertain the idea of investigating anything in the realm of Bigfoot, it would probably end up being a disservice to Bigfooting.